The Breeze Borrower Mouse is a breed of mouse found in the Moussu Picchu. A gentle heart resides in this soft-spoken mouse. She has the rare, innate ability to pluck raw essences straight from the soft breeze itself. She collects this for the more powerful Wind Wanderer mice that have the ability to harness this essence into something more powerful. The Breeze Borrower Mouse has been found to be especially attracted to Standard Cheese and Glowing Gruyere Cheese, to the point that any other kind of cheese will simply not suffice. Only Shadow, Arcane and Draconic type traps are effective against Breeze Borrower Mouse, all other power types are ineffective. 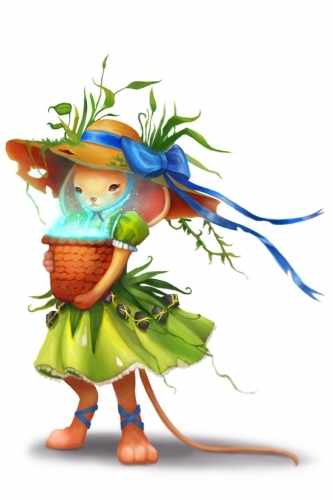 6 September 2017: The Breeze Borrower Mouse was introduced as part of the Moussu Picchu release.